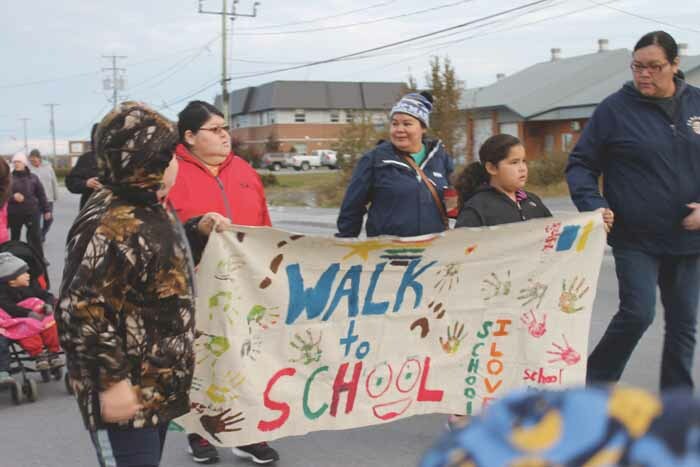 Hand in hand with their parents and other community members, this October the children of Eeyou Istchee participated in activities celebrating “Walk to School Month,” an initiative held in over 40 countries worldwide to get children out and active. In Mistissini, Wally Rabbitskin, a Planning, Programming and Research Officer for Physical Activity, said there were activities in all the Cree communities with the goal of getting kids active on their way to school. Rabbitskin said it is an important annual initiative to encourage parents, children, teachers, volunteers and community members to participate in an activity that everyone can do. “The main thing is that we want to promote the most healthy lifestyles in the community because diabetes is on the increase and we need to prevent this from happening,” said Rabbitskin. This year students in Mistissini participated in activities October 6-8, that featured walks for different age groups followed by a healthy breakfast and some special classroom activities for everyone. “If you look at our community’s culture and history, our people used to walk everywhere, on snowshoes in the winter and on foot to their hunting grounds in the summer. They were physically active, but nowadays things have changed. We need to be healthier and so sometimes we should be choosing to walk to work or to school,” said Rabbitskin. According to Mistissini school nurse Ashley Darbouze, this year’s event featured 30- to 40-minute walking routes for children. While this is only her second year participating in the event since arriving in Mistissini, Darbouze says the kids are enthusiastic about the event. “The students get quite excited because a lot of them do walk to school, so to have someone encourage them to continue really helps. Also the fact that this is followed by a healthy breakfast at school is very exciting to them. We do an easier walk to school for Grades 1-3, and a harder one for Grades 4-6. This is followed by a healthy breakfast that the nutritionist puts together,” said Darbouze. Darbouze said it is wonderful to see the impact on the young participants. “It gets everything going. The kids are moving before they get to school so they are not waking up only after they get to class. They arrive excited because they have been active,” said Darbouze. At that, when it is time for these children to sit down and learn after a morning that has included physical activity and a nutritious meal, they are ready to go. According to Stephanie Secord, a Mistissini nutritionist who plans the meal portion of the event, the goal is to share as much nutritional information and tips as possible by showing what can constitute a healthy meal. “We keep the meal both nutritious and quick because we don’t want to disrupt classes as part of the goal here is for the kids to have a good morning at school,” explained Secord. Secord said that accessibility and ease are the main factors behind the food choices for the event, choosing products that are easy to obtain and prepare. While some may have the impression that serving a healthy breakfast can be time-consuming, Secord’s menu showcased only an extra 10 minutes to prepare. “The parents learn that even if they are running late, they can still give their children a granola bar, yoghurt and a fruit. This way kids don’t go to school with empty stomachs,” said Secord. And, with healthier, happier, well-fed and active students, the potential for greater school outcomes increases significantly. For Rabbitskin, passing on these lessons to the youth is essential. “The best thing for us is to talk to the young people, get them to set goals for themselves and get them to take up a healthy lifestyle because it is this that will increase their life spans,” said Rabbitskin.